Kim is a novel by Nobel Prize-winning English author Rudyard Kipling. The story unfolds against the backdrop of The Great Game, the political conflict between Russia and Britain in Central Asia. It is set after the Second Afghan War which ended in 1881, but before the Third, probably in the period 1893 to 1898. The novel is notable for its detailed portrait of the people, culture, and varied religions of India. "The book presents a vivid picture of India, its teeming populations, religions, and superstitions, and the life of the bazaars and the road." In 1998, the Modern Library ranked Kim No. 78 on its list of the 100 best English-language novels of the 20th century. In 2003 the book was listed on the BBC's The Big Read poll of the UK's "best-loved novel." From Sea to Sea and Other Sketches, Letters of Travel is a book containing Rudyard Kipling's articles about his 1889 travels from India to Burma, China, Japan, and the United States en route to England. This collection is usually called Letters of Travel 1892-1913 in the 21st century. Kim is a fabulous adventure story set in India during the former British Empire. It tells the story of a street-wise but (in typical Kipling fashion) highly moral Anglo-Indian boy who becomes enmeshed the “the Great Game” -– the competition between Britain and Russia for control over Asia. Taking time off from his role as the traveling companion of an aged Tibetan lama, the boy is trained as a spy, matches wits with various evildoers, and wins out in the end. So much more than just a spy story, Kim is one of the most enjoyable books that you will ever read -- or have read to you. Rudyard Kipling (1865-1936) was born in Bombay, India. He was the author of many short stories and novels including The Jungle Book. A portrait of Kipling by John Collier, ca. 1891. http://upload.wikimedia.org/wikipedia/commons/f/f9/Collier_1891_rudyard-kipling.jpg accessed May 18, 2015. A picture showing the Lahore Fort and Hazuri Bagh Pavilion in 1870. Lahore Museum held special significance for Rudyard Kipling as his father, John Lockwood Kipling, was one of the museum’s most renowned curators. Do you think young Rudyard may have played in the gardens and on the Zamzama Gun? 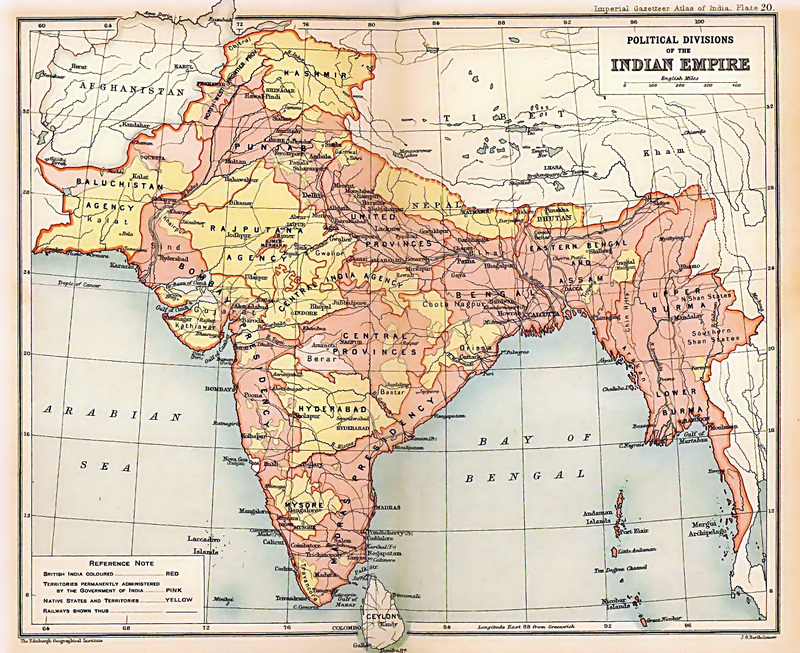 The "Zamzama" is also known as "Kim's Gun"
Click to Enlarge: The British Indian Empire, from the 1909 edition of The Imperial Gazetteer of India. Areas directly governed by the British are shaded pink; the princely states under British suzerainty are in yellow.